We remember our apartment days with great fondness: only one bathroom to clean; fun neighbors across the hall; no grass to cut. We loved the apartment lifestyle, but they can be tricky places to decorate. Most come standard with beige Venetian blinds, neutral walls and strict orders from the landlord not to paint or hang wallpaper. How do you brighten up the décor and stamp your living space with your individual style? Decorative curtains in your apartment can allow you to add color and personality to an otherwise drab space, and bright curtains will open up a small space if your square feet is limited. Ceiling or wall mounted curtain tracks and drapery hardware are great for hanging curtains in your apartment. Our customers love our 84003 track with 84162 Wall Mount Brackets because they are the least obtrusive to the eye and the brackets only leave small holes that can be easily repaired when removed. If you live in a basement apartment, we even have tracks that you can mount on a drop ceiling. Speaking of basement apartments, and even some above ground apartments we’ve seen, they can be short on windows. Hanging curtains strategically can give the illusion of windows (just keep them closed!). If you are living on a budget you may have a simple bed frame with no headboard. A creative friend of ours hung floor to ceiling sheer curtains behind the head of her bed that gave the impression of an elegant sleeping area. You can take this look even further using our 6100 Flexible Curtain Track to hang a sheer curtain all the way around the bed for an exotic look. Curtains in your apartment can be useful for decorating and creating virtual walls or storage space. We love curtains for decorating apartments, but as our friends at Apartment Therapy will tell you, they can be practical as well. For example, if you live in a loft and are craving a more traditional space, you can create a virtual wall using long curtains and a ceiling-mounted curtain track. If you are short on storage you can use drapery hardware and curtains in your apartment to create a closet or storage area. You can even block off an entire wall to hide your storage bins and mountain bike. 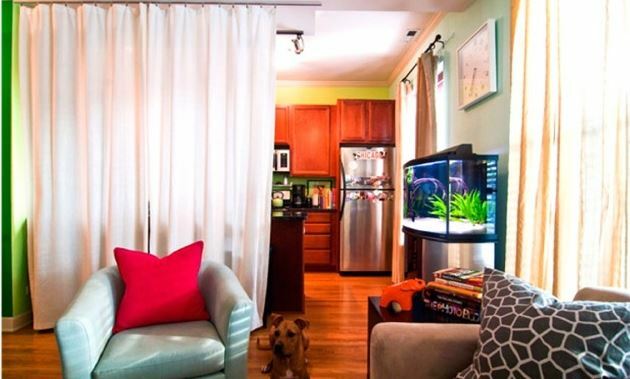 We would love to see the creative ways you have put curtains to use in your apartment. Send us your photographs and a description to info@curtain-tracks.com.